QUESTION: The largest surviving structure from the Philadelphia Centennial Hall has been repurposed and is currently used as what? The blog is going to take a different tact today - please don't be scared. 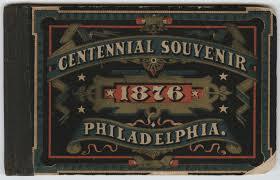 Normally, we discuss pieces that have a presence in our collection, but today we are going to talk about an event that happened in 1876 as a celebration of one hundred years since the signing of the Declaration of Independence: the Philadelphia Centennial Exhibition. Major European cities had had world's fairs for a while by this point, a chance for nations to represent the innovations going on in them, to show off their successes and wealth. By 1876, the United States wanted into the action, and the Exhibition was how they did it. Located in lush Fairmount Park, taking up 450 acres, thirty-seven countries participated in it and twenty-six of the then , and around ten million people attended. It was a smashing success for the country on every level. It was the first time Americans saw any part of the Statue of Liberty - the arm. The statue itself would not go up in New York Harbor for another decade. What was most amazing about it, though, were some of the inventions put on display for the first time ever, including the telephone, the electric dynamo (the original industrial-strength motor that would lead to all modern machine-operated devices), and most notably for the world of automatic music - the player piano. It would take years for the player piano to become available for middle-class and wealthy families to purchase, and longer still before nickelodeons (orchestrions) became a mainstay of stores and restaurants, but it was a start! Oh, and if you're a fan of root beer, Hire's introduced their widely popular brand at the Centennial, too. And Heinz their ketchup. And the first monorail in the world Okay, we could go on. Let's just leave it with how amazingly important this event was for the development of important innovations, and go get us some ketchup-flavored root beer. Ewww.